It’s difficult to find a central bank speech or press release that does not implicitly or explicitly uphold the “independence” of the central bank and its conduct of monetary policy. Of course, there are many central banks that have no independence at all, including failed states such as Venezuela and totalitarian states such as China. But the central banks of major democratic liberal societies do have a plausible case that they are free from political interference. Don’t believe it. My first rule of thumb when a party repeatedly insists that something is true is that it’s probably not. Why repeat something incessantly if it’s so obviously true? The second rule of thumb is just to look at the historical record. Where was Federal Reserve independence in 1934 when FDR confiscated the Fed’s gold and moved it to the U.S. Treasury in exchange for paper “gold certificates”? Where was Federal Reserve independence from 1941–1951 when the White House insisted on rock-bottom interest rates to finance the Second World War and the Korean War? Where was Fed independence in 1971 when Nixon ended the gold standard? Where was Fed independence in 1972 when Nixon demanded — and got — low interest rates and money supply growth to help his re-election effort? There are many more recent examples, including 2008 when the Fed and FDIC guaranteed all bank deposits, money market funds and commercial paper at the insistence of the U.S. Treasury and the White House in order to deal with the financial crisis. The same patterns emerge when looking at the ECB’s political response to the Cyprus and Greece financial crises, which were actually orchestrated by Angela Merkel and Germany. 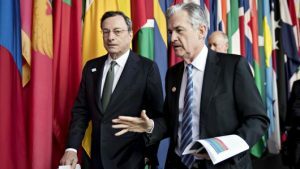 This article offers a brief overview of the myth of central bank independence using examples drawn from Europe, Asia and Africa in addition to the Fed examples noted above. This article is a good one to save and re-read the next time you encounter some central bank true believer who tries to insist on central bank independence. It’s a myth.